The pansies were made with the Rose, Pansy, Camelia, Gardenia Punch and Stamp set and I added some little buds. The blue detailing on the pansies was done with a Promarker and I added a little gold glitter to the centres. 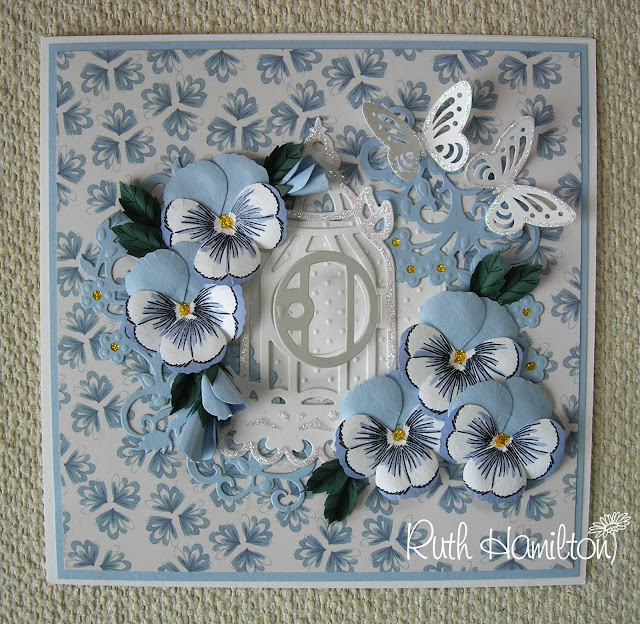 The birdcage, branch and multi detail butterfly are all also Tonic Studios dies.The beautiful paper is from the Watch the Birdie 8x8 paper pad. I've used Papermill's white felt embosssed cardstock for the card base, the dotty embossed part, the birdcage, the 3 pansy petals (which I then stamped) and the butterflies.